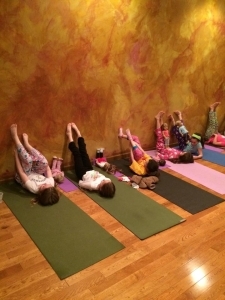 Ho-Ho-Kus Yoga offers children’s classes weekly. Through the practice of yoga, parents can expect their child to improve strength, flexibility, posture and coordination. Through breathing exercises, meditation and relaxation techniques, children learn to relax, focus and reduce stress. Classes are organized by age group. Please see our schedule. Have a little Yogi in your life? What’s more fun than a yoga-themed party? Our certified children’s yoga instructor will lead a special class and craft for your group. It’s a fun and healthy way to celebrate! Please contact us to discuss planning your party! Ho-Ho-Kus Yoga regularly runs special events for kids, including: workshops, parties, parents’ night out and more. These events are well-attended and have received rave reviews. Below is a list of our upcoming events.